In this post: 2018 Back 2 School pics. 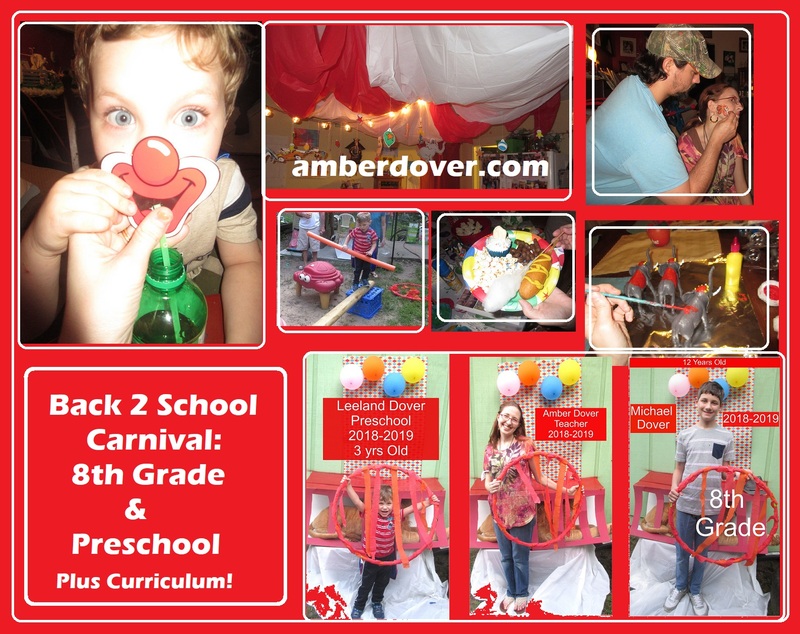 Our Back 2 School carnival with fun crafts, games, and yummy food! Also 8th-grade & Preschool curriculum. Plus The Greatest Showman movie night. PS: Check out our schoolhouse if you haven’t yet! Okay, back to the carnival! Unfortunately, several pictures are blurry. It was hard to find good shots. These were taken before Chris gave me a new camera. My old one has been dropped way too many times! Dr. Seuss Circus cutouts, string lights, and red & white plastic tablecloths make up the Big Top. I found the tableware at Dollar Tree. The Circus elephants are toy elephants from Dollar Tree that I painted. I made the food signs with clipart I found online. You can also see the invite I gave my parents. School Sample Ferris wheel- My family got to sample our curriculum. Our Photo Backdrop– I used wrapping paper for the background. Then I made a poster board cage for our stuffed lion. The Lion Tamer’s ring of fire is made with a hula hoop and crepe paper. Add some balloons and voila! Ready to party-I’ve had the musical clowns since I was a kid. I think my dad gave them to my mom. They added a nice touch! Cotton Candy, Popcorn, Peanuts, Corn Dogs, & Animal Cracker Cupcakes! All the tastes and smells of a carnival! Yum! How do I make my cotton candy, you ask? Well, I use plain sugar and add vanilla extract. Sometimes I add rootbeer or peppermint to kick it up a notch (separate not together). The cotton candy machine does the rest. While we ate, everyone watched music videos from The Greatest Showman. Also, everyone sampled our curriculum for the new year by checking out the Sample Ferris Wheel and the books left out. Then we took school pictures. I read a YA book recently where the main character lamented the woes of picture day at school. I remember those days so well. It’s funny because we don’t have that with homeschool. Our picture day is always a party. No boring backgrounds here….this time we tamed a lion! Me (Amber)- It has been a challenge to teach 8th grade AND preschool. My youngest is just jumping into the world of ABC’s and my eldest is looking towards high school next year. While I’m trying to get Michael into a serious mindset with goals and all, we’re also trying to have a laid back year in some areas. I’m sad that his last year of middle school is going so fast. Preschool is very organic and full of playtime, but there’s more of a schedule than tot school. Leeland’s sensory and attention issues mean I have to work extra hard to make 3 minutes here and there count. I kind of feel like a juggler…going back n forth between messy play and serious equations. I’m thankful though that God has entrusted me with such precious boys. My Parents (Nana & Grandad)– We love having my mom and stepdad as our guests. They are always good sports. Skeeball- made from poster boards and balloons. Walk the “Rope”– crates & a board. Face Painting Contest- This doubles as a game and a craft. More Cotton Candy Fun- Cotton candy tastes better fresh...so I let everyone try making their own. It definitely doubles as a game or cooking craft! Art- mainly lessons centered around history, holidays, or Bob Ross. We have really branched out this year...with painting, pottery, wood carving, and even work with packaging tape. Yes, fun times coming your way! Most of my ideas are Pinspired and mixed to my liking. I can't wait to share them! Books with Progeny Press- Frankenstein, The Hunger Games, Fahrenheit 451, Jane Eyre, The Fellowship of the Ring (LOTR), Hamlet, The Twin Towers (Yaaa Lord of the Rings! ), Return of the King (LOTR), and Huckleberry Finn. I love the study guides from this company. They help kids filter books through a Christian worldview, instead of mindlessly consuming media. Most of these are high school level but they have younger guides too. Yeah, a few of these books have some dark subjects. It's awesome that someone else did the work for filtering them through a Biblical perspective. The study guides work as a Language Arts curriculum (at least for me). Michael has vocabulary words, comprehension questions, and essays. I'm learning that essays are what college is made of! So great college prep here! Kumon & Spectrum as a guide for Prealgebra and Algebra- I'm making my own tests and we're rarely using worksheets. Snap Circuits- fun and...science? Lets go with that :). Science & Geography- The Periodic Table, Weather, & States books from Barnes & Noble. I've also got several Pinterest ideas to go with these...fun hands-on stuff. Explorer & Discovery Magazines from Answers in Genesis. We subscribed to these many years ago but Michael was too young then to show interest. Now he's enjoying them. I only had an issue with a few theological disagreements...so we used the ones that align with our beliefs (Bapticostal...lol more Baptist than anything). So yes....science was very eclectic this year. This was our fun year. I have been making my own tests to cover all of the material we've gone over. Michael would say the tests aren't fun or easy. Music has been centered around the holidays and a few harder pieces for fun. Michael did this awesome piano song called Aviators. I'll try to upload a video in the future. He's really good at it. Also, he's been learning worship songs on guitar. I'm super proud of his hard work. Well to start, I've learned that Preschool and Pre-K are different. Pre-K comes right before Kindergarten and is usually for 5-year-olds. Preschool comes before Pre-K and it is for 3 to 4-year-olds. Every kid is different of course. Michael began Pre-K at 3 and a half and Kindergarten at 4. Leeland just isn't ready for that. Our preschool is super laid back because even that is hard. My goal with Leeland this year is not just to teach him the alphabet, shapes, and numbers. We are working on therapy for his special needs. We do exercises for speech and for behavior. We do a lot of sensory things. Character and manners are a big deal for both my kids. So we work on that too. A lot of our worksheets come from https://www.teacherspayteachers.com/ and things I find on Pinterest (link at the end). I also find art ideas there or just put together something simple on my own. Dollar Tree is a great place for crafts and activities. I use a lot of sensory toys (which I buy on Amazon or at Dollar Tree). I also use household objects to teach...like clothespins. We have circle time songs and rhymes that I find online. Also, we have some favorite channels on youtube. We use puppets and lots of hands-on materials. The kids often go outside to play or we take trips to the park and other fun places. Leeland goes to the kid's gym a couple of times a week. Some of it is structured and some of it free play. He goes with kids a year younger than him, which has worked out great. Music is a mix of piano and other instruments. We used Wunderkeys for a bit but now it's really all about trying out different instruments and enjoying music. Leeland just doesn't have the attention span for more than five minutes of music time. Starfall is great too! I used their free games to teach Michael how to read way back when. I didn't buy a subscription because I think ABC Mouse is the better deal. However, Leeland loves their free games. Playtime- we play often. As I said before, we get outside and we go places. Our homeschool group is full of friends and fun. Leeland was born into this group and that really helps him with anxiety. The kids are different ages, which is great for a kid with Aspergers. Sometimes he plays with Michael and his friends and other times he plays with the little kids. I love how our group has mixed ages. It just feels true to real life. We have special guests, events, and trips often. We spend a lot of time in the community and we give back to the community. We also have a great church. Michael does a lot in the Youth group and Leeland has Sunday school buddies. Michael is in a Chess Club and he'd be in Upwards Basketball again if they offered it to 8th grade. I can't sing the praises of Upwards enough. Anywho, I say all this to give people a glimpse into our homeschool lives. We do leave the house and yes, we have friends. These days the world really is a playground for homeschoolers. There are so many options and fun things to do. The Greatest Showman Movie Night- I love The Greatest Showman. I'm a sucker for musicals and I enjoyed this one better than Les Miserables. So I put together a simple movie night with an easy treat and props for fun. Balloon Animals- Chris, Michael, and I all tried to make them but only Chris succeeded.